Another interface for Mobil, to build the trust image for Mobil, I try to make the website interface resembled a research folder. 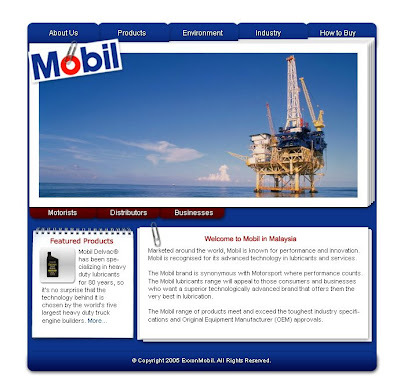 Mobil user in Malaysia mostly are mature audience where they choose Mobil because they trust that Mobil have the best quality oils. I use research folder to make audience understand the Mobil keep doing research to give the best to their customer. Is it supposed to be a folder? I think it looks neat. Anyway, There's no page indication on where I am right? Or did I miss it out?